The Supreme Court has ordered to take up the appeals filed by the former Prime Minister Mahinda Rajapaksa and his Cabinet of Ministers, seeking the void of the interim order issued by the Court of Appeal suspending them from functioning, again on 14th of March. The appeals were heard before the Supreme Court judge bench comprising Justices Buwaneka Aluwihare and Murdu Fernando this morning (06). 122 MPs from the United National Party (UNP), Janatha Vimukthi Peramuna (JVP), Tamil National Alliance (TNA) and Sri Lanka Muslim Congress, who had signed the Writ of Quo Warranto petition against Mahinda Rajapaksa holding office as Prime Minister, have been named as the respondents in the appeal. The attorney, representing these respondents of the appeal, informed the court today that more time is needed to obtain legal advice regarding the withdrawal of the appeals filed by his clients. Hence, he requested the Supreme Court to take up the appeals on another day. 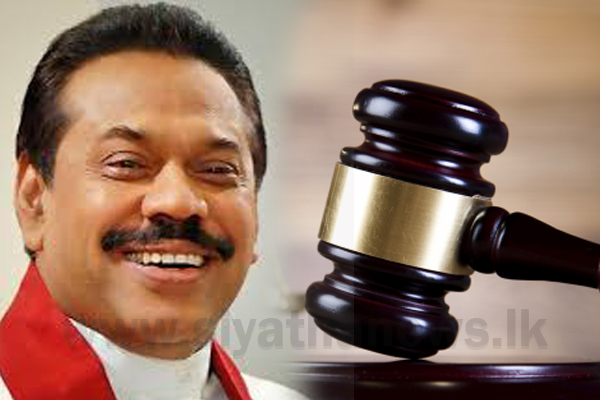 The attorneys representing Mahinda Rajapaksa and his former Cabinet Ministers told the court they are willing to consider the withdrawal of the appeals filed by their clients if the respondents are to withdraw the petition they have filed before the Court of Appeal.